Gemista are the famous Greek stuffed peppers (pron. Yemista). In fact, Gemista is Greek for any stuffed vegetable roasted whole, usually stuffed with rice. Typically stuffed peppers or beef tomatoes are the most popular. Greek Stuffed Peppers – the making of! Gemista (Greek stuffed peppers and tomatoes) work amazingly well as a vegetarian recipe by leaving out the mince meat – but either way it comes out delicious. Greek stuffed peppers range from a vegetarian’s delight to a carnivorous fix, they are pretty easy to make and are brilliant for feeding the family. Gemista, pronounced yemista is one of those dishes I remember from growing up and something I always enjoy when I visit my folks and my mum makes them. Greek stuffed peppers are laced with nostalgia and taste bloody fabulous – especially with a drizzle of gravy on top! Stuffed peppers tend to be the most popular vegetable to stuff and roast – but if truth be told – it’s the stuffed aubergine (or eggplant!) at my mums house that the family fight over! The great thing about Gemista or Greek stuffed peppers is once you’ve made the stuffing you can use this for pretty much anything that can hold it; stuffed bell peppers are the obvious choice, but stuffed aubergines, stuffed courgettes (or stuffed zuchinni! ), stuffed beef tomatoes are to die for and if you’ve got a delicate hand (and sharp knife) a stuffed onion is a thing of beauty. The stuffing needs to be punchy! You want to pack as much flavour into the stuffing as possible. While it cooks, the rice expands, the liquid you use will dilute the stuffing so you want to start with something really rich. This is a slow cooked dish, you want the peppers, eggplant, whatever it is you’ve stuffed to slowly soften and concentrate all those lovely flavours and you can’t rush that bit. But! The good news is the preparation only takes 15 minutes, so once you’ve made your filling 80% of the work is done. 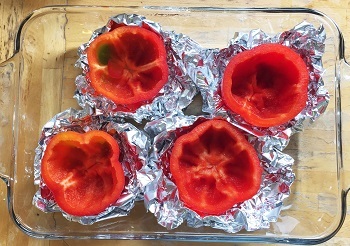 Reheating – the good news is stuffed peppers are great re-heated in the microwave. They don’t lose any texture or flavour; so make extra so you have a few left over for lunch. I sometimes wrap the bottom of each pepper in foil to help them stand straight and avoid any falling over! Finally, don’t have too sloppy a stuffing as you don’t want the rice to go mushy. 250g mince meat (I like lamb but pork or beef mince works fine). Handful of chopped parsley, coriander, any other herbs you want. 1 tbl dried oregano (I usually add 1/2 tbl dried mint but that’s optional). Start to fry the onions and garlic in olive oil on a low heat until just starting to cook through (about 5 minutes). Turn up the heat to medium/high and add the mince meat (if using), once it has started to cook through add the rice and the wine and cook until the wine is absorbed. Now add 1/2 tin of tomatoes and the rest of the ingredients. Gently simmer on a low heat for about 10-15 minutes until most of the liquid is absorbed..
Now the fun part! Spoon the stuffing into the peppers until about 3/4 full, distribute the rest of the tinned tomatoes on top of the stuffing in each pepper with another little drizzle of oil. Put the pepper tops back on and stick in a roasting tray. Add a large cup or two of water into the base of the roasting tray and loosely cover with foil. Bake in the oven at 180c covered in foil for about an 1hour. Remove the foil and continue roasting for another 15-30 minutes or until just charred and soft. Remove from the oven and check the stuffing, if the rice is a little dry for your liking add a tablespoon of hot water. Either way, let the stuffed peppers rest for 15 minutes to an hour before serving. Serve with a nice side salad and a drizzle of your favourite gravy! I’m chuffed to have finally got my Stuffed Peppers recipe online – it has to be one of my favourites! OK, stuffed peppers aren’t the quickest meal to make but are so worth it! And they also make exceptional leftovers!